Use these vacation scrapbook layouts and ideas to preserve those precious moments. Whether you were relaxing in the sun on a white sands beach or hiking the John Muir Trail. 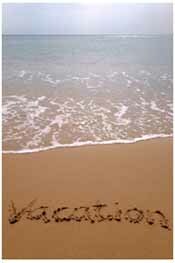 Do not leave your vacation, instead, enjoy it forever by scrapbooking your photos. Keep your ticket stubs, favorite restaurant coasters or match boxes, and other souvenirs from your trip. You can use these memorable pieces for embellishments in your scrapbook. A neat background idea is to write out your trip itinerary and include snapshots of each day! Or better yet, display a "Road Map" on the first page of your vacation album, displaying all of the stops on your trip.